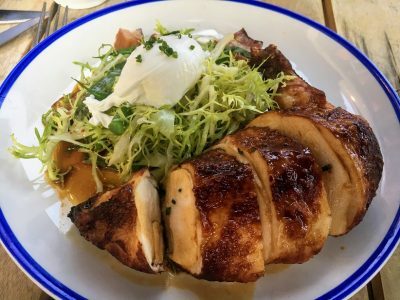 There may be nothing in the food world harder to pull off than a great neighborhood restaurant. So many pieces have to come together. First you need a great neighborhood, the more diverse the better, because that’s where you’re drawing from and a diverse crowd is always more interesting. Then you need good food — not necessarily great food — but food that’s consistent and a solid value and never, ever fussy or pretentious. Third, it’d better be low-stress. You need to be able to show up on any night without advance notice and get fed. Fourth, you need to get the alcohol right. I’m not a big drinker but I want someone behind the bar who looks like they could star in an Angry Orchard commercial. But here’s the trickiest part. You can do all of those things well and it still may not work. Because ultimately a great neighborhood restaurant depends on something as ephemeral and unpredictable as feelings. People have to feel a sense of belonging and well-being when they walk through the door. Those of you who loved the Mr. Rogers documentary know the kind of welcoming embrace I’m talking about (for those, like me, for whom the documentary was simply a traumatic reminder of being forced as a kid to sit through that unwatchable show, it’s kind of like Cheers). With that, let me take you to two of my favorite neighborhood restaurants in DC. One that gets almost everything right and one that’s struggling a bit to handle its own success. 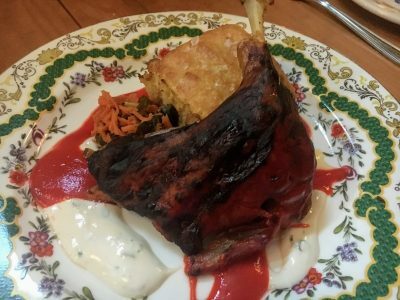 Before I describe my dinner at Primrose in Brookland, let me stress that I’m not making any of this up. It may look like a new section of Westworld for vacationers to live out their neighborhood restaurant fantasies, but I could understand everything that was happening around me, so it clearly couldn’t be Westworld. I was almost to the front door when something caught my eye on the patio. 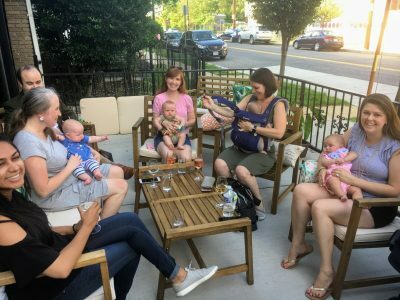 It was the neighborhood moms-and-babies club that meets every Thursday night for happy hour. They greeted me like the taps had run dry and I drove the rosé delivery truck. At that point I thought, well, that’s as good as it gets, there’s no topping that. 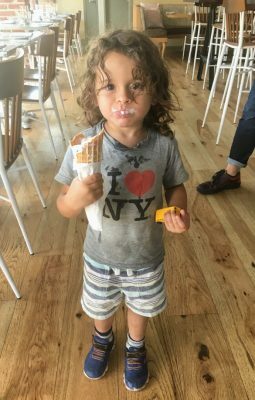 And then I walked in the front door and ran into The World’s Most Adorable Child eating a drippy vanilla ice cream cone. Turns out it was the son of co-owners Sebastian Zutant and Lauren Winter and he’d just finished eating dinner and was heading home with mom. 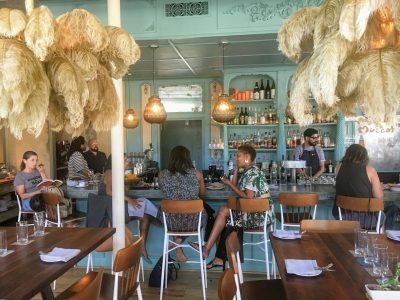 I could have easily eaten inside among the ostrich leaves and laid-back vibes. But it was the first non-rainy night of the week, so we sat on the side patio. They don’t reserve the tables outside, but if you get there before 7 pm, you can almost always get one. 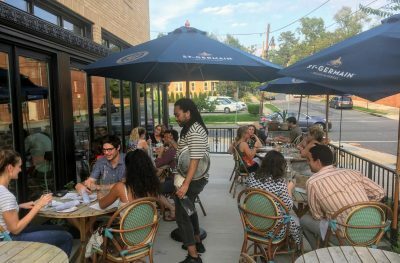 Most of the customers are regulars and the servers move easily among them, asking about vacation plans, kids and neighborhood gossip. 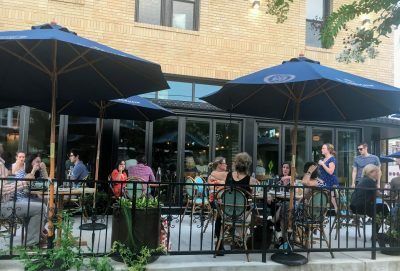 One couple tells their server they’re moving to the area in the fall and he brings them welcome-glasses of wine and Sebastian stops by to ask where they’re moving and says he knows the exact house. I suddenly have an overwhelming desire to live in Brookland. 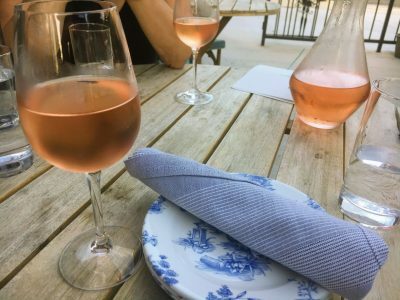 Rosé (on tap) all day. 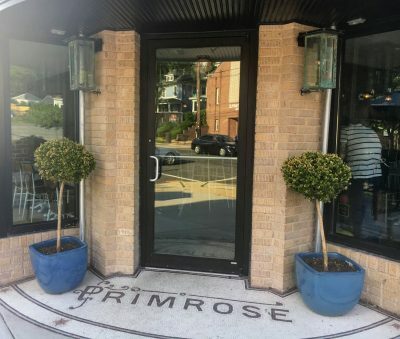 Speaking of which, if you don’t know co-owner Sebastian Zutant, he’s one of the top wine gurus in DC and has been a constant presence every time I’ve eaten at Primrose. In other words, order your wine with confidence. 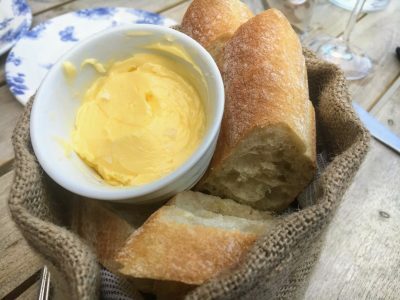 The food at Primrose is familiar bistro fare, like this gratis baguette with butter and sea salt. The best salad I’ve had in a while. What the menu doesn’t mention is the delicious melange of celery, red onion, chives and chervil lurking at the bottom of the bowl. 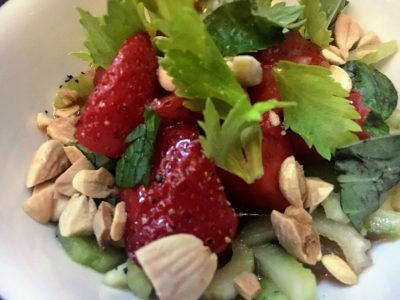 It’s a summer salad so go now before it disappears. 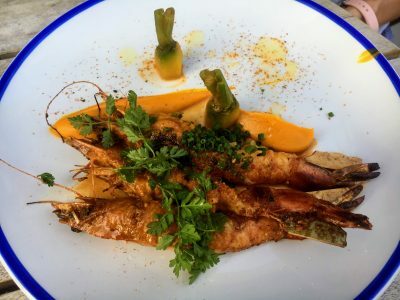 Nicely grilled head-on shrimp with slightly spicy carrot sauce. Would’ve been better with the forgotten garlic chips but realized they were missing too late. Lovely vegetarian entree. Would have been Instagram-worthy if I’d taken the pic after my wife broke the yolk. Rookie mistake. 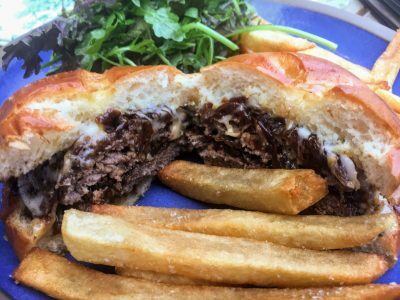 Basically a French onion soup burger. The thin double patties are more cooked than I like but still pretty tasty. Roast chicken is well-seasoned, meaty and moist (likely brined). As a dark-meat fan, I think menus should warn customers if the chicken doesn’t include a mix of white and dark meat. 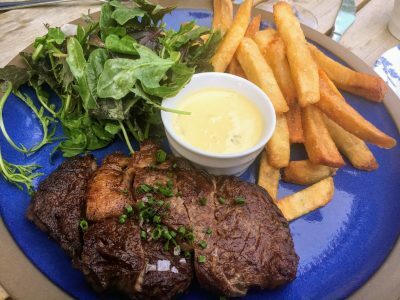 Tender, beefy and oozing fatty juices, just what you want from a ribeye. 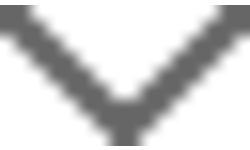 Ellē is located in the heart of Mt. Pleasant, another great neighborhood. 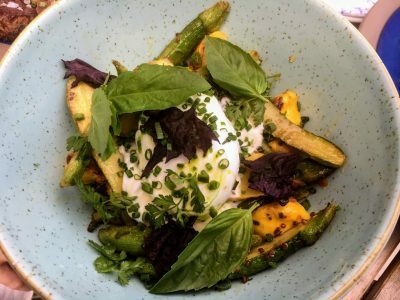 But perhaps because of its proximity to areas like Columbia Heights and Adams Morgan, and certainly because of the ambitious and eclectic cooking, Ellē is no longer simply a neighborhood gathering spot. It’s become a destination. 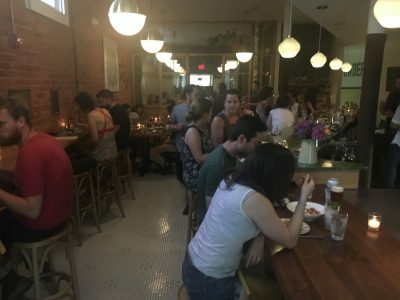 I talk to a lot of people about where they’re eating and Ellē is one of those places that people either have tried or have on their “list.” So it’s usually packed, even on weeknights. They do take reservations (on Resy) but you’d better plan 2-3 weeks out. 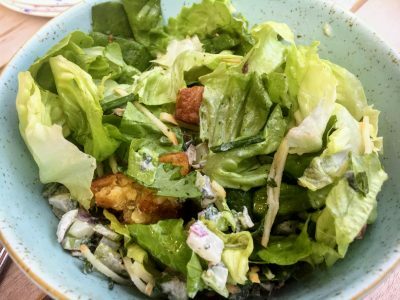 If you’re looking for a more relaxed, neighborhood vibe, try Ellē for breakfast or lunch. 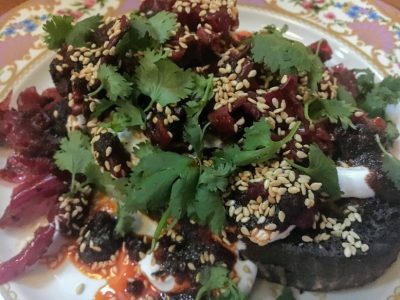 Cheek-by-jowl dining at Ellē. The wait staff still does an admirable job but they have a lot of ground to cover and have to move quickly. For better or worse, there’s not a lot of chit-chat for me to overhear. 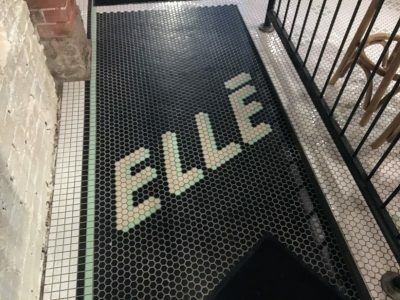 Ellē is associated with a bakery, so let that inform your ordering. This country bread is available grilled or fresh. Unlike the baguette at Primrose, this’ll cost you $5. Maple and dehydrated olives sounds odd but it works. The feta itself gets compacted from the marination, giving it a firmer, less crumbly texture. Feels like a dish you’d get at Rose’s Luxury — sweet, sour, crunchy, nutty, and herbal notes that feels perfectly seasonal. 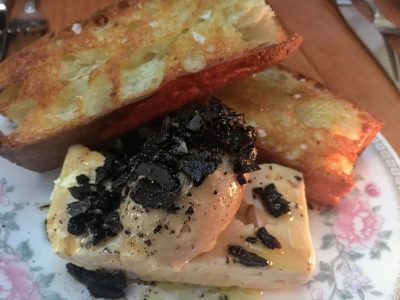 The dish that put Ellē on the map. 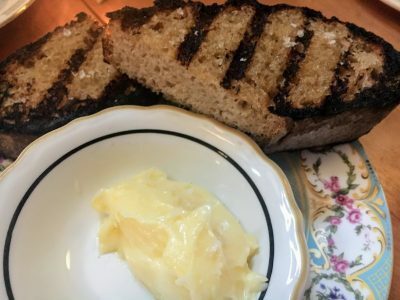 A toast that rivals the best in town at Tail Up Goat or Momofuku. The purple cabbage-kimchi is pretty mild, so don’t let that worry you if you’re not a kimchi fan. Unfortunately, this version is not as good as the one I had when the place first opened. That Kimchi Toast was a revelation; this one was merely decent and my table mates couldn’t quite understand why I was making such a big deal out of it. Is that because the place was so busy that some poor line cook was deep in the weeds and couldn’t save the toast from getting burnt? That would explain the over-dressed salad earlier. Or did I enjoy it more the first time because I was high from the discovery of a new and exciting place and now it’s been discovered? Probably yes and yes. The stuffing is the key to this nice Mexican-influenced porgy. 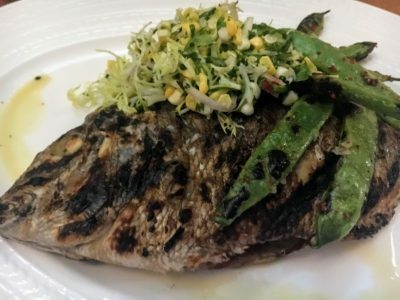 It gives some backbone to the fish and fresh corn slaw. Maybe the best dish of the night that wasn’t bread. The duck has a little five-spice and comes apart easily in soft shreds. This didn’t work for me. Start with the steak, which lacked beefiness and quickly got cold by being pre-sliced in the kitchen. I know kitchens must think the Instagram generation wants to see the rosy slices of meat on the plate but as a diner that means I’m racing the clock to eat the steak while it’s still warm. Then look at the rest of the plate. Yes, peaches are in season, but what do they have to do with the steak? Are they supposed to be eaten together? Separately? Ditto for the ricotta. Perfectly good ingredients that don’t belong together. 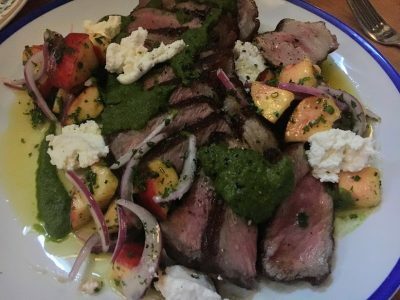 I ended up eating the steak with the onions and salsa verde and the peaches with the ricotta. Go for the ice cream and cookie crumbles. The mint chocolate mousse is mostly dull. I hate reviewers who say they’re reluctant to tell people about little hidden gems for fear they’ll be overwhelmed. First, I’d love to have that problem. Second, these places are not really hidden — certainly not Ellē at this point. So go. They both deserve to succeed. As for me, I’ll probably be pining for Primrose whenever the weather’s nice. You’ll find me on the deck with a glass of rosé from the tap and a salad d’été, swinging my elbows around because I can. 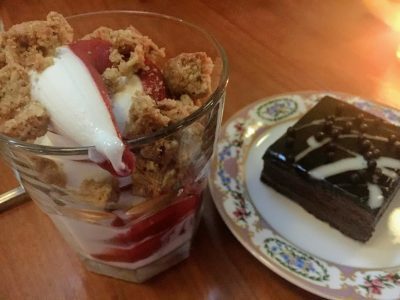 This entry was posted in Articles, NE, Restaurants DC. Bookmark the permalink.